The Art of Hosting is predicated on a very simple set of practices which we call the Four Fold Practice. This framework emerged from a conversation in the late 1990s between Toke Moeller, Monica Nissen, Carsten Ohm and Jan-Hein Nillson about what patterns make for a meaningful conversation. After talking about it for days, the clarity that arose was that people experience meaningful conversations when they are present, when they participate, when they are hosted and when they co-create something. Simple. The next question then became, what if these four patterns were actually practices that could be cultivated both by individual leaders/facilitators and by groups? What would that be called? The answer was, “That would be called the art of hosting.” And so a collective inquiry was born that has spread around the world and been taken up by tens of thousands of people working in all forms of leadership, organization, and community. I sometimes feel that the four fold practice doesn’t get the attention it deserves. Sometimes people can confuse the Art of Hosting with the methods we use or the way we harvest conversations or the tools that help us design things. But that’s not what it is. The Art of Hosting, at its deepest essence, is these four practices. 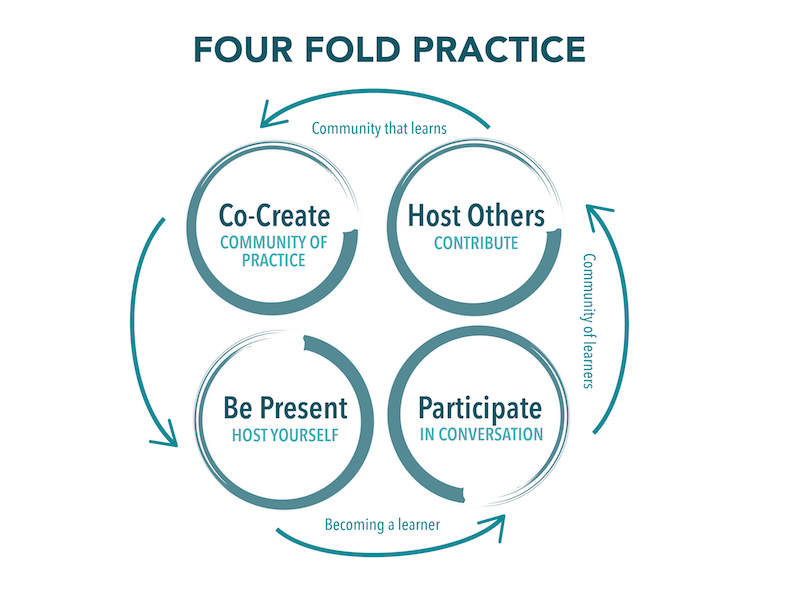 Today we are beginning an Art of Hosting workshop with some community foundations in British Columbia and tonight we began by introducing the four fold practice in some depth, because when all else fails, coming back to these practices will at least remind you how to invoke patterns that make engagement and dialogue meaningful. We began by telling the story of the practice and where it came from (you can learn a bit about that here) and then we led people in a simple exercise to explore it. Then we asked people to talk about which of these practices they were weakest on and what they were eager to learn about. These learning questions were captured on index cards and placed in our centre where we will use them to focus our teaching and inquiry over the next three days. It’s a simple way to dive into these practices, acknowledge that there are lots of ways to come into an Art of Hosting workshop, and build on the strengths that people have. And it allows us to discover the learning agenda in the room and tie it to the practice. It’s a rich harvest.